"Port Business is essential reading for all those with an interest in trade and transportation and the role of ports in the global supply chain. It discusses the various types of ports in existence, identifies the major ports per category, analyses what the key business drivers are, describes their governance, how they are managed, which trends influence them, and what kind of impact they have on supply chains. 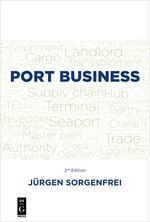 Dr. Jürgen Sorgenfrei uses his significant consulting and project development experience within the international ports, shipping, rail & logistics sector, and in global economics, trade, analytics, and forecasting as well as in intermodal hinterland transport to provide this comprehensive overview of port management. The book is a combination of a strong background in principles and practical knowledge and is an indispensable resource for those interested in maritime economics." Please click here for further information and to purchase the insightful book.